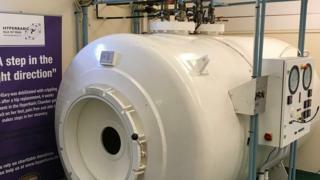 An "obsolete" hyperbaric chamber which helped the recovery of up to 95 people a day will be replaced "towards the end of the year", a charity has said. Hyperbaric Oxygen Therapy Isle of Man's equipment, which came into service in 1984, was closed in June 2018. The charity hopes to raise £400,000 to replace it, which increases oxygen levels to help the healing process. The TT Riders Association said many bikers had used the facility and was "very pleased" it would be replaced. The organisation's honorary secretary Frances Thorp said it was "much needed" as some of the riders they help "come over [to the island] specially to use the chamber". Designed to treat divers suffering from decompression sickness, hyperbaric chambers can also been used to aid recovery from radiation therapy, crush injuries and skin ulcers. Dr Alex Allinson MHK, whose patients have used the Douglas facility, said it had helped "a number of people with complicated fractures recover faster, including riders injured in the TT". He added that there was "a body of evidence to support significant benefits" from the treatment. A spokesman for the facility said they were "optimistic" the new chamber would be open "towards the end of this year".